This year's Nolcha runway shows attracted a more global group than ever, bringing independent designers from Turkey, Peru, Swaziland, Dubai, Thailand, Australia, Saudi Arabia and the United Kingdom to New York Fashion Week. Transforming Chelsea's Pier 59 into a star-studded catwalk, the showcase highlighted a number of ethical and eco-conscious brands such as Richard Smith Prêt à Porter, Arrum Lilly, KabukiU and Priti by Design. Step inside our gallery to get a peek at the sustainable looks that caught out attention the most. Swaziland-based Arrum Lilly‘s colorful patchwork aesthetic is a happy byproduct of the recycled materials mixed into the line. Designer Tanya Aab collects upholstery swatch books and left over fabrics from textile factories and combines them with other fabrics in a fresh new way. In addition to their eco-conscious philosophy, Arrum Lilly estimates that their 5 full time employees make an average of 250% above government minimum wage, and the company strives to surpass all standards set by the Swaziland Fair Trade Association. British menswear designer Richard Smith spiced up the runway with his Prêt à Porter collection. Part of Nolcha’s first men’s fashion show celebrating the Best of British Menswear Designers, Smith closed the 4-designer group show with crisp, chic men’s suits with a European twist — printed linings, peek-a-boo colored vents, and checkered prints. 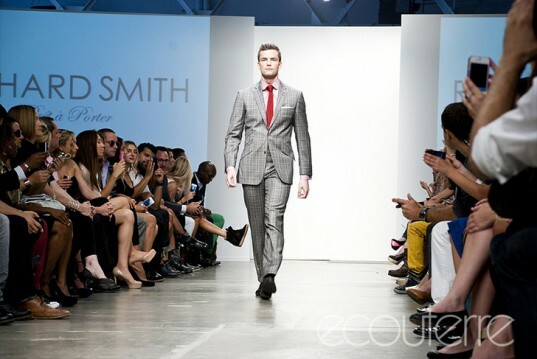 “I wanted to have a bit more fun with the every day work business suit,” Smith told us after the show. “I wanted to make everything really nicely fitted and at the same time you can still go to the board meeting, but you have a bit of character, a bit of personality to it.” All of Smith’s suits are handcrafted in-house in London and made from 100% natural materials, such as silk, wool, linen and cashmere. Smith also had a very surprising cast of notable NYC businessman that included Ryan Serhant fromMillion Dollar Listing New York on Bravo and Henry Stimler, owner of SoHo restaurant, Jezebel. “I wanted to have a bit of a spin on it and not use standard models to make a statement,” Smith told Ecouterre. “I wanted promote myself as more of the business side of suit making to be fair. It came together pretty well.” The businessmen turned models looked like they had a great time walking the runway; Ecouterre even overheard some people think they were actual models! “Backstage, the guys were like kids. It was a good laugh. It was fantastic,” Smith revealed to us. Priti by Design‘s SS ’13 collection was largely evening wear -centric and featured some interesting convertible styles. Designer Priti Bali’s aim was to fashion sets of clothing that can transform to create many different looks. A number of the garments had components that were detachable so that a plain black dress could be converted into something with a pop of color. Australian-made KabukiU brought a colorful glimmer to the Nolcha Fashion Week runway for the fourth year in a row with a collection of 1960s inspired kimonos. Although the emphasis was meant to be on the kimonos, a collection of dresses and pants-suits worn under the kimonos also drew attention. Designer Telina Webb stresses the importance of overseeing production in Australia to ensure good working conditions and fair wages. Swaziland-based Arrum Lilly's colorful patchwork aesthetic is a happy byproduct of the recycled materials mixed into the line. Designer Tanya Aab collects upholstery swatch books and left over fabrics from textile factories and combines them with other fabrics in a fresh new way. In addition to their eco-conscious philosophy, Arrum Lilly estimates that their 5 full time employees make an average of 250% above government minimum wage, and the company strives to surpass all standards set by the Swaziland Fair Trade Association. Priti by Design's SS '13 collection was largely evening wear -centric and featured some interesting convertible styles. Designer Priti Bali's aim was to fashion sets of clothing that can transform to create many different looks. A number of the garments had components that were detachable so that a plain black dress could be converted into something with a pop of color. 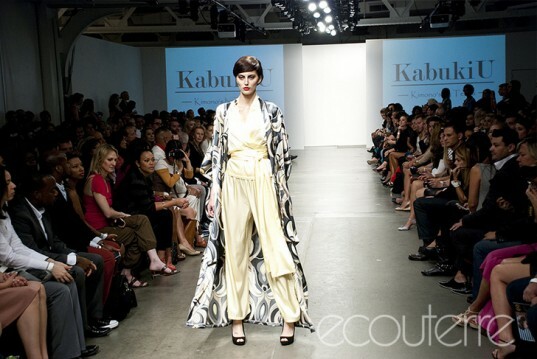 Australian-made KabukiU brought a colorful glimmer to the Nolcha Fashion Week runway for the fourth year in a row with a collection of 1960s inspired kimonos. Although the emphasis was meant to be on the kimonos, a collection of dresses and pants-suits worn under the kimonos also drew attention. Designer Telina Webb stresses the importance of overseeing production in Australia to ensure good working conditions and fair wages.